Honda City, ever since its first launch in India in the year 2008, has been a much loved sedan. Recently we saw the new version of Honda City in five variants in both petrol and diesel engine options. Being a sedan of high cadre, the Honda City comes blessed with features like defogger, ABS with EBD along with automatic air conditioning with touchscreen control panel, rear AC vents etc. varying from variant to variant. 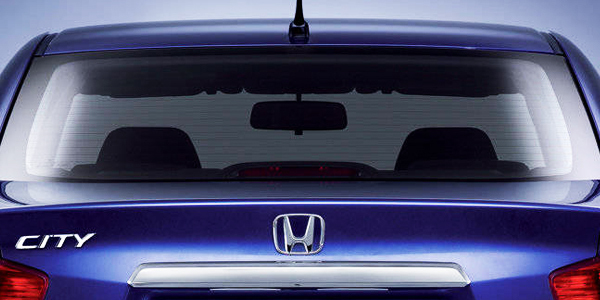 Like for most cars, even the Honda City defogger works on the rear windshield via the thin brown strips that run horizontally through it. Via this grid an electric current is passed which helps remove the mist and frost. This helps the driver feel comfortable while driving even in an extreme weather because with this Honda City defogger he would have a clear view of the road and traffic behind him. It is advised that a defogger be switched off as soon as the pane clears because it is known to consume a lot of battery. The variants of Honda City that offer defogger as standard include 20th Anniversary Edition CVT Petrol, 20th Anniversary Edition MT Diesel, V CVT Petrol, V MT Diesel, V MT Petrol, VX CVT Petrol, VX MT Diesel, VX MT Petrol, ZX CVT Petrol, ZX MT Diesel, ZX MT Petrol. The variants of Honda City that do not offer defogger as standard include S MT Petrol, SV MT Diesel, SV MT Edge Edition Diesel, SV MT Edge Edition Petrol, SV MT Petrol.